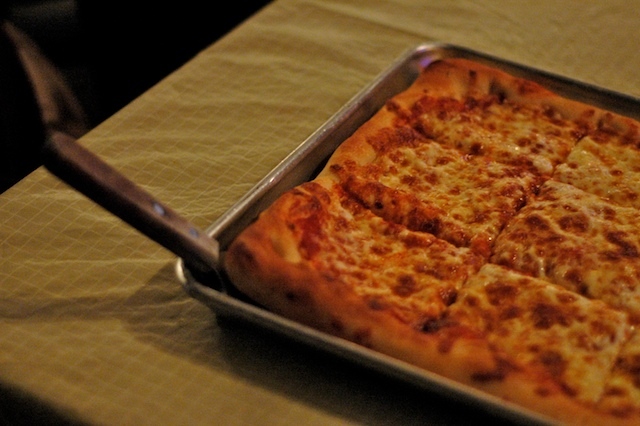 Tasty pizza from Play by Play. On Thursday night before practice some Hellions met at Play by Play (the bar where we have our after bout parties). We has some pizza and salad (carbs for energy before practice!) and enjoyed each other's company. 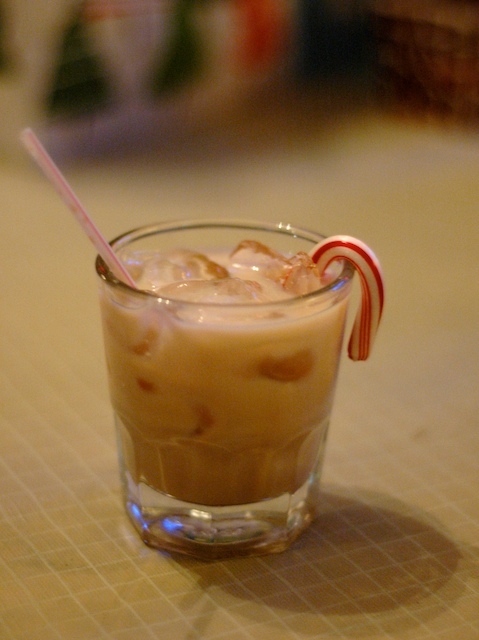 I also had a mint chocolate Bailey's on the rocks (with a candy cane, haha!) I couldn't indulge too much because I had to skate in a couple hours. I was happy that Shrimp Scampi was there because I haven't seen her in a while! Anne the Bonny Basher, one of our skaters who moved away this summer was also able to make it, and she stayed for practice. Hooray! Except that Anne hits like a truck and I am scared of her. About 16 people participated in our Secret Snowman (same thing as a Secret Santa gift exchange). 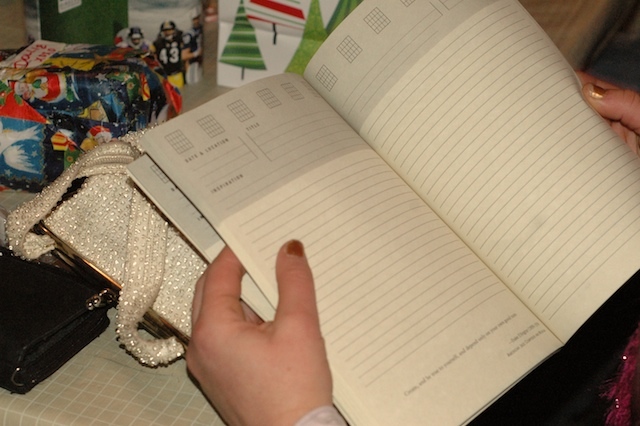 Mathundra Storm got a book for writing down song ideas. Did you know Storm is an accomplished musician? Cool derby gift: Polar Derby! Polar Derby! According to the description: the game is a rolling polar bear jam. 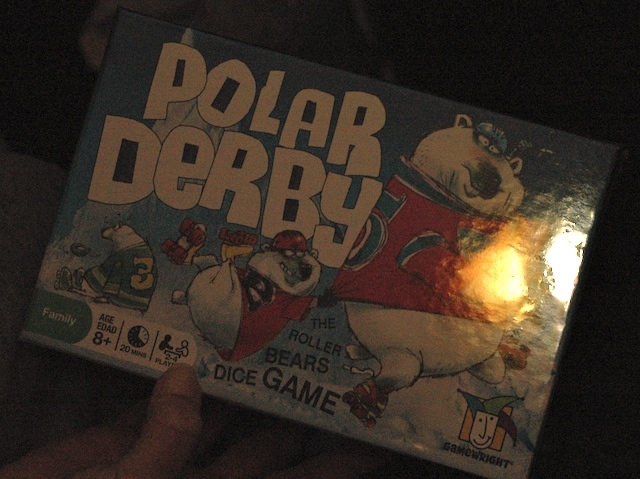 Roll the colred dice to collect high scoring polar bears from the rink. Roll doubles to trip up opponents or "Free Skate" to take your pick of the pack. But press your luck too far and you may wind up flat on your face. The player with the most points skates away with the victory. girls can be geeky sometimes. Ok, a lot of times. I got custom derby booty shorts from Ursula Udders! Awesome!! They were made by Hot Across Buns on etsy. And lastly, I got my secret snowman, Snausage, a custom My Monster Hat Scarf (in Hellions colors!) made by the talented Anne Persand. 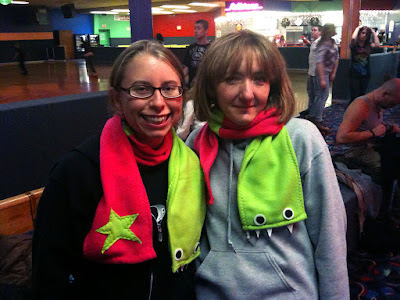 I also ordered myself a matching scarf :) Snausage, as you may recall, recently wrote a guest post on about Hellions practices. 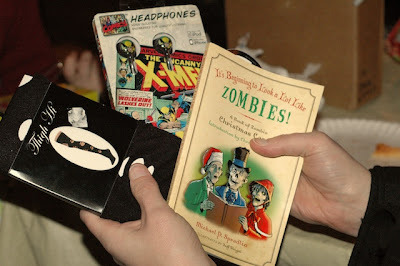 Other people got various derby gifts such as socks and tights. 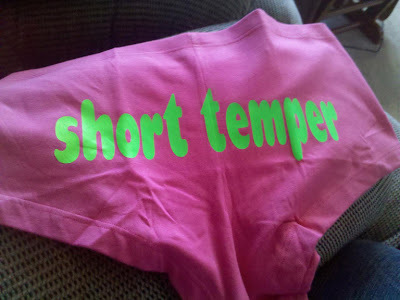 A few items (the booty shorts, socks, and Monster scarves also appear on my roller derby fashion post, if you wanna read more about them. Thanks again to Ursula for coordinating our little get together. After our party, we headed over to practice (conveniently about 0.3 miles away). 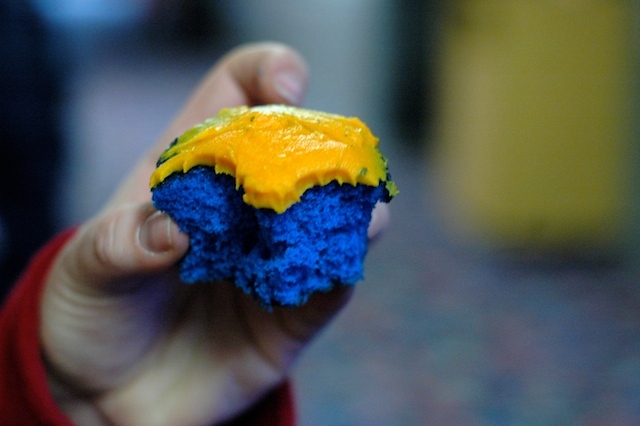 As if we hadn't induldged enough at the party, Ursula also brought these crazy colored cupcakes. Look at the blue! Of course, Ursula got a cupcake recipe book as she seems to be our resident baker of tasty and unique treats.